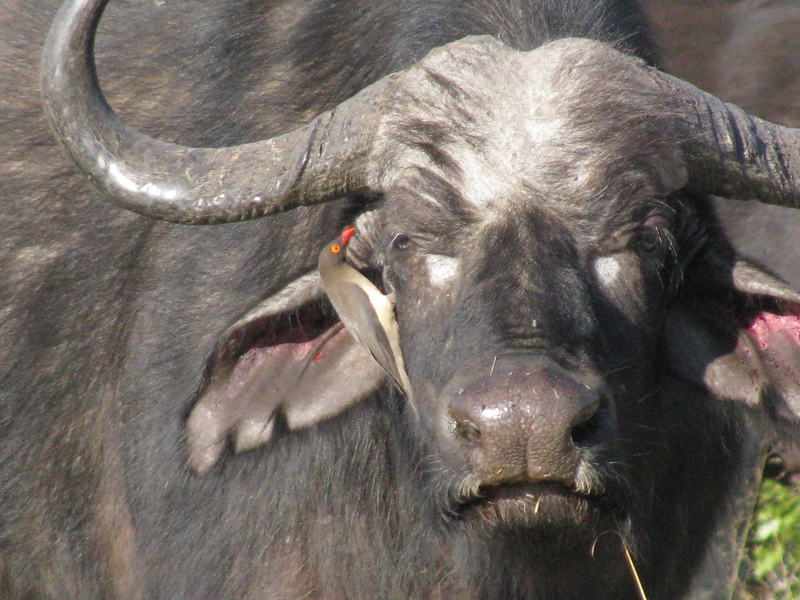 I couldn’t tell if this buffalo was more annoyed by having his photo taken or by the bird on his face. The bird is a Red-billed Oxpecker. These birds feed on ticks found on animals. This entry was posted in Africa, Travel, Travel Photos and tagged Africa, African Photos, Botswana, Buffalo, Chobe National Park, Nature, Photography, Photos, Red-billed Oxpeckers, Safari Photos, Travel Blog, Travel Journals, Travel Photos, Wildlife. Bookmark the permalink. I wouldn’t want to mess with him! Buffalo are very dangerous beasties! Oh the guide made that very clear. Believe me Nia, I’m glad I wasn’t his focus either. I don’t think I could run that fast! Thanks! I was amazed that so many of the animals didn’t even notice the birds. I saw them on giraffes as well. They are being helpful. Buffaloes are very serious beasts. LOL…I won’t tell him if you don’t! Hmmmm…I don’t know, but I’ll let him be the boss and leave him alone. With a look like that, I won’t argue. I don’t think many creatures would try to boss him around…I know I wouldn’t. I couldn’t even see the bird at first! Haha. Great shot. The guide had to point him out to us! I was transfixed on his glare. LOL…I love your sense of humor! The zoom function on my camera has been my protector on many occasions! He looks both placid and angry at the same time. Thanks Dave. It does seem like he has a lot of thoughts going through his head and yet is only focused on one thing. That one thing is you and your lovely expensive camera, Buffalo have very expensive taste in cameras, no point and shoot for them, it’s all about manual settings and megapixels to them. LOL…good to know the next time I run into one. Now that’s a fierce buffalo. And he seems to be looking straight at you. I won’t lie, his intimidation tactics worked! How funny. He looks so grumpy, I can hear him grumbling! What an amazing shot! It didn’t seem like he was having the best of days. It was hard not to giggle when watching him, but I didn’t want to hurt his feelings or antagonize him. I would lose the battle I think.